4 miles today. Four very cold miles but good run overall. Recently, I was given the opportunity to read the book, "Do Life" by Ben Davis. The book was not out yet when I got it so I received a pre-distribution copy but there's a picture of what the actual book looks like below. What the actual copy looks like. I think many of you would say, Ben Davis? Who's that? It's probably what I would say. But perhaps if I mentioned he made a great video a couple years ago about his weight loss journey, I'm sure most of you would know him. Ah, yes, this video. It's received over 1.7 million hits since he posted it. Well this Ben Davis decided to write a book about his journey. First off, I'd like to say that the book is very well written -- of course, it helps that he was a journalism major. It starts out with a foreword by Kara Goucher. It's very easy to follow and the format of the book is a little different from many books out there. Yes, it's about his journey to lose 120 pounds but along the way, he also includes advice(especially for new runners), readers questions that he answers from his blog along with training tips. He talks about his feelings of taking that first step along with how he thought when doing his first Ironman. At the back of the book, he also includes a glossary of running terms that explains what many of us runners have found out through running. The thing I like most about the book? It's real life. Don't get me wrong, I love reading about the pro's and how they do some incredible things but I think that this book will appeal to us all because it's real. It's just a regular fat guy that learns how to take his life back and lose the weight. Of course, he just so happened to do it through running so it makes for an even more interesting story. I compare it to the Ironman specials they have each year. While I love seeing the pros come in so quickly, it's the age groupers that are the most inspiring stories. This is a story that I think many, many runners can relate to. Not that everyone has lost the significant weight that he did - that is incredible, by the way. I do think, however, that if you have ever struggled with your weight in the past, or if you are struggling now, it's a source of inspiration. I can relate to it myself because many of the feeling he had were similar to what I felt when I started running. It's not a book that shows you how to weight loss even through he did lose weight. It's about what his thought process was in starting the commitment and keeping with it. It's about how his family supported him along the way. It's about the process of going from a runner that could barely run two blocks to one that is doing Ironman races. 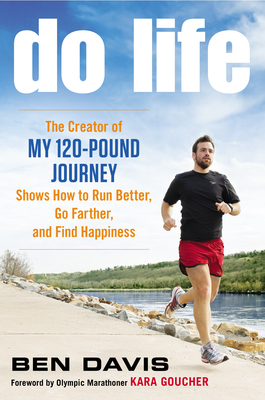 It's about "doing life" and how running changed more than just his weight loss. It's worth picking up a copy to find out. It will inspire you do do something more. At bookstores and online now. Note: I received a complimentary copy of the book, "Do Life" by Ben Davis in exchange for a review of the book. All opinions are my own and I was not required to give a particular opinion. That is a very inspiring book and journey. Have a super 2013 Jeff!